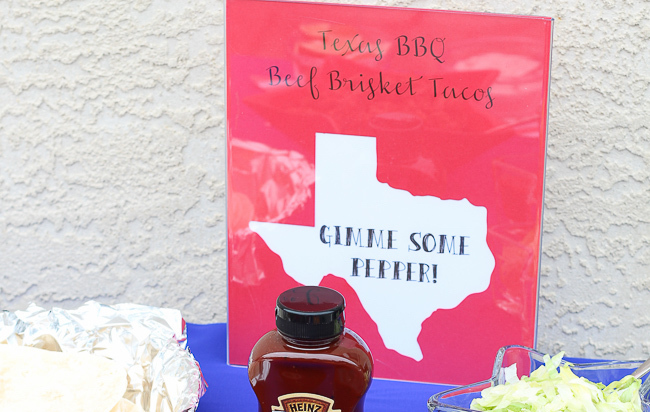 Since the regional BBQ is the star of the party, I wanted to highlight the unique regional elements that set each BBQ sauce apart with signs that mark the food and also share the BBQ’s characteristics. 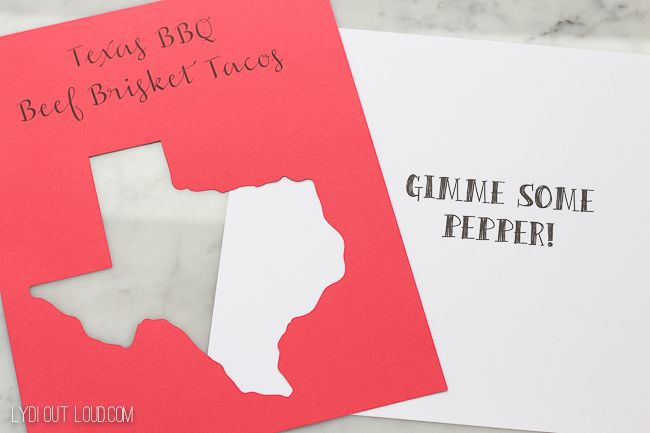 First I printed out the names of each BBQ dish on red 8 x 10″ card stock. Underneath the dish title, I used an electric cutting machine to cut out the state’s shape where that particular BBQ sauce resides. I printed out a blurb about that region’s BBQ sauce and printed it out on white 8″ x 10″ card stock. 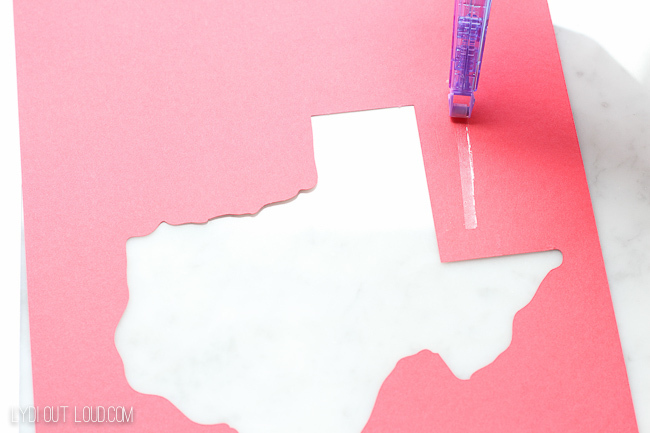 I cut the white paper so that the BBQ description fit in the middle of the state and glued it to the back of the red card stock. I placed the signs in clear 8″ x 10″ frames and stood them behind their respective dish. 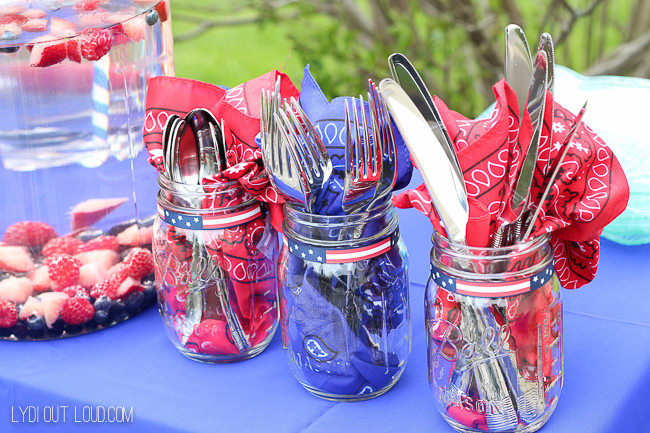 I used mason jars with red and blue bandanas as silverware caddies and tied some flag ribbon around the rims of the jars. 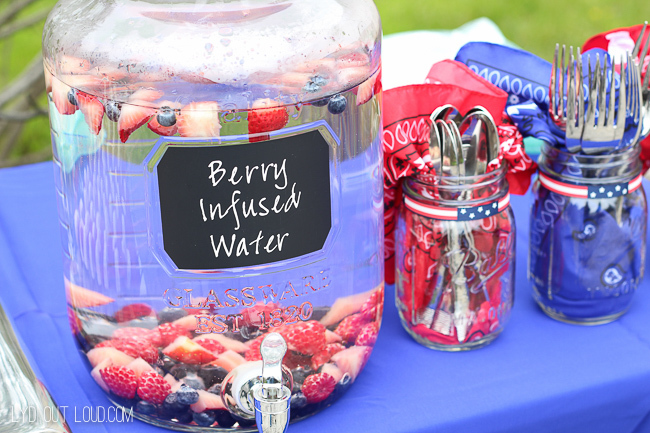 Blueberries and strawberries make perfect Memorial Day party embellishments and are right in season. I love tossing them in some water for a refreshing infused water. 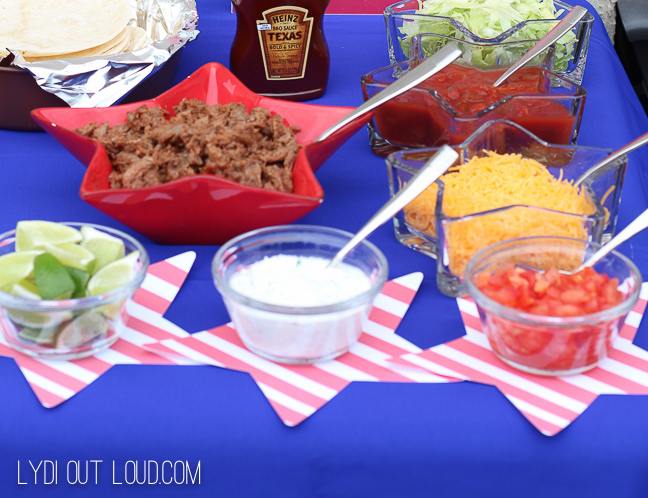 What is your favorite way to celebrate Memorial Day? I can’t use this in my round up because it’s food instead of crafts. BUT I absolutely love these ideas and pictures. So cute. Thanks for sharing your link on the roundup group! How festive! I love the state shaped signs! What an amazing presentation! It looks like a high-end catered event! The creative ideas are truly inspiring. Great pictures! Makin’ me hungry!! Loving that barbecue season is here! Barbecue sauce is good on everything! I love the combination of sweet hot and spicy! I will look forward to trying some new flavors. Love your patriotic decorations …so festive! I agree Elaine, and thank you so much!